We continue to reiterate our efforts to work towards safer roads, calm traffic and happier lives. February marks the beginning of the ‘India Road safety week’ a week which focuses on creating awareness about the current traffic situation in India. The ‘India Road Safety week,’ hails it’s legacy from the year 1972 by the ‘Ministry of Road Transport and Highways,’ will observe the 48th such week between February 4 – 10 in the country. The Road Safety week is a week for everyone including drivers, pedestrians, hawkers, in general everyone who uses the roads, sidewalks, traffic islands and pavements. We all are the privileged users of the national roadways network – be it intercity, national highways, or within the city. We all use the roadways in our towns, cities or even rural areas to commute to different places in our daily life such as school, work, travel and then back to home. Poor road conditions, smooth highways, snaking ghats, rough terrains, bumpy rides, traffic snarls, absolutely nothing stops us or deters us from making our journey and heading towards our destination. As we go about our routine, many of us give it a thought to what a single careless act can lead to. Our daily commute is so set in our memory that we almost operate on auto pilot with a perception that we commute daily and it is just another day. The number of Road Accidents happening in India are twice as much as China – even though China has a greater people and vehicular population. The death toll of India due to accidents is almost 7 times more than that of crime related deaths. National Safety Council of India (NSC) is an autonomous body set up by Government of India to engage with the public on safety, health and environment issues. NSC along with the Ministry of Road Transport and Highways and regional governments set a week as the National Road Safety Week in India. The Ministry allocates a special budget to each state to help them organize the road safety week activities. Two-wheeler riders are at the highest risk of being killed in a road accident. 31.5% of the people killed in crashes over the last 2 years involved Two-Wheelers. Tamil Nadu (69,059), Maharashtra (63,805), Madhya Pradesh (54,947) and Karnataka (44,011) are four of the worst performing states, with the death toll due to accidents at approximately 8% of the total fatalities globally. Delhi recorded the highest number of accidents, injuries and fatalities among all Indian cities, followed by Jaipur, Bengaluru and Kanpur. 43.7% of the road accidents in India are caused due to over speeding, this can easily be avoided if people drive with care and follow speed limits. India not only needs more responsible drivers, it also calls for stricter road safety laws. Each one of us need to drive more cautiously on the roads and follow the rules. Only then can Indian roads become safer and loss of life can be prevented. This year the Road Safety Week (February 4 to 10) will be celebrated with the theme of “Sadak Suraksha – Jeevan Raksha. Keeping committed with the lines of the Sadak Suraksha – Jeevan Raksha theme, here is what the CEO, Louis Newman shares. “Organized chaos” is possibly the best way to describe driving in India. The rules that people actually use are uncodified and yet if one has grown up in the system, one knows. And yet more than 150,000 Indians have lost their lives in traffic-related deaths this past year. As roads become ever more congested with drivers in a hurry to get to their destination, the situation becomes more dangerous. We have been working in India since 2016 with the government to develop strategies with local authorities, private campuses and smart cities to make roads safer for all drivers. From driver feedback signs that alert drivers to their speed, to traffic cameras to identify dangerous speeders and issue warnings, Traffic Logix is working to make Indian roads safer. Road Safety Week’s theme this year is ‘Sadak Suraksha – Jeevan Raksha’ (Road Safety – Protection to Life) which fits in with our company’s mission to develop solutions to help drivers change their habits and globally reduce accidents and fatalities. With over 10,000 streets worldwide protected with a Traffic Logix solution, we pride ourselves on working to save lives and to improve well-being every day, with every person who interacts with us or with one of our solutions. We believe in making a difference in helping India realize a significant reduction in road fatalities. 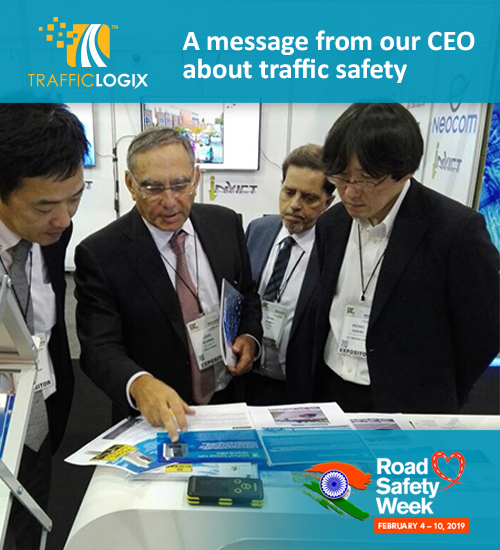 On behalf of Traffic Logix India, I am proud to participate in Road Safety Week 2019 and in the effort to improve Indian road safety. PreviousPrevious post:Slow-Down To a Smarter Drive With The Most Safe Traffic Calming Solutions.NextNext post:Traffic Safety Week Statistics – They are not just numbers; each of them was once a life!